Also known as Shinedown show number eight. b.) we’ve been talking about it FOREVER and if we didn’t do it now, we never would. Thanks to that, we got in to the venue (Pepsi Center) early … and we probably got to the venue way earlier than we even needed to in the first place. Oh well. We were ushered into the building, checked off a list, got our tickets scanned … and then herded to the club level to some cordoned off area. From there, we got swag bags* and then all sat around until we got word that the band was coming up. We stood up, essentially forming a circle around the room. The guys came in and split up to sign things, with Brent Smith and Zach Myers going one way around the room, and Barry Kerch and Eric Bass going the other way. We got Eric and Barry first. From the instagrams, we know they fly Delta all the time, so B has been hoarding Biscoffs (the shortbread cookies DAL is kind of famous for serving) to give to them. All four were happy when they found out, but I think Barry was the happiest. “OMG I love these!” (almost a direct quote) I also wrote thank yous for the Myers, Kerch, and Bass families – as I’m also married to someone who’s gone a good chunk of the time, I wanted to let them know that I appreciate the sacrifice that it takes on their part and that I understand their struggle to some extent. And that we fans thank them for sharing their husbands with us. I think this struck a cord, as both Eric and Barry thanked me on two separate occasions for the gesture. Brent Smith is an absolute sweetheart. Seriously. That man is freaking adorable. Super nice and I think he was chatting with people to find an excuse to ask for a hug (me: 8th show. B: his Shinedown quote on his RoadID) (yes, we both hugged him). He also said he loves Delta and bragged that he has the most miles out of all of them. I hope Zach was okay, as he seemed a bit off. He’s mentioned anxiety lately, and I wonder if it was bugging him. Still nice, though, and he flashed his Delta AmEx Platinum card, which cracked both of us up. After they all made it through, we got to take pictures with the guys. We were considering doing a photo together and then separately (and B did a separate one with just him and “the Other Guys” (that is, Eric and Barry)), but I forgot to ask. From L to R: Barry Kerch, Eric Bass, B, me, Zach Myers, Brent Smith. Also don’t let the angles fool you; none of them is taller than us. Post-photos, we were let free to get early access to merch. In the line, we heard that they were letting all of us early access people on to the floor, so we split up – B went to run down to get us a spot on the rail. I didn’t see anything (originally) at the merch table, so I went to the bathroom and then in search of a little bit of food. Nothing looked good (whyyyyyy has your food gone so downhill, Pepsi Center? It used to be so good 20 years ago … back in high school … holy crap I’m old), so I just got us a pretzel to split and some water. I go down to join B … and hear they’re selling show-specific guitar pick packs. Eff. So I dump my stuff and run back up … and even though the packs were super limited, I think I was able to snag one. And the last one, I’m pretty sure. 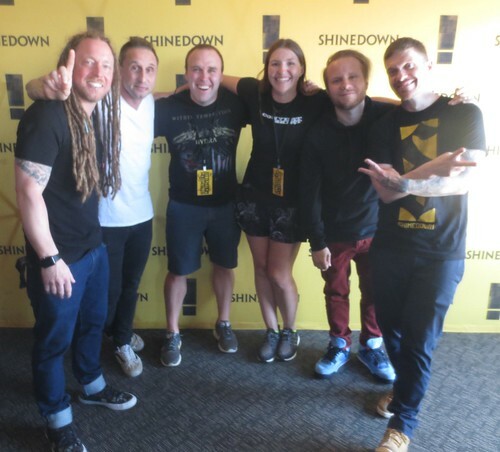 If you recall my post from our last Shinedown show, I was able to catch each of the show-specific picks from that show and I really wanted the ones from that night. As catching picks is NEVER a guarantee … $20 well spent. After standing around a long time, the opening act, Like a Storm, took the stage. They’re a hard rock band out of New Zealand, and were actually pretty dang awesome. Even though a Kiwi friend of ours joked that they’re going to have their citizenship revoked for playing a didgeridoo during the show. Whatever. The didgeridoo was f’ing awesome. I also managed to snag a pick during the set, so yay for that. I need to look up their stuff on iTunes, and I’m hoping they’re more like Sixx:AM as opposed to Insomnium, in that their studio stuff is equally as good as their live stuff. Shinedown was amazing as always. Clean, tight show, with very little downtime. The only bit there was happened because Brent hopped down onto the rail to make sure someone was okay (we had a few people pass out during the show – standing outside in the heat for hours prior to doors open with no food or water for several hours is NOT SMART, people). But right into it, song-by-song. Band was a well-oiled machine. We got three songs off the new album, including “Get Up” which YOU NEED TO LISTEN TO. RIGHT NOW. GO. Open up the link in a new tab and listen to it while you finish reading. Or listen to it and then come back. BUT LISTEN TO THE SONG. There’s a reason that just a video of a song (without even the actual music video) has damn near three million “views” on YouTube. It also goes without saying that I cried throughout the whole thing. We actually didn’t catch any picks this show, but it’s hard to catch them when none come near you. We did get a drumstick, though, but as we already have a BKerch signature stick, we traded it for an Attention Attention guitar pick. No regrets there. The one shot I got … and really only got it for the purposes of this post. Still loving actually enjoying shows without worrying about taking photos. As we had to meet a friend who’s moving off to grad school in a week early the next morning for a hike, we didn’t stay for Godsmack (wouldn’t have been home by 9:30 otherwise! … again, we’re old). If a few of the songs I really liked that they’ve been playing on this tour were early in the set we would have considered hanging out for a bit, but they weren’t, so home it was. 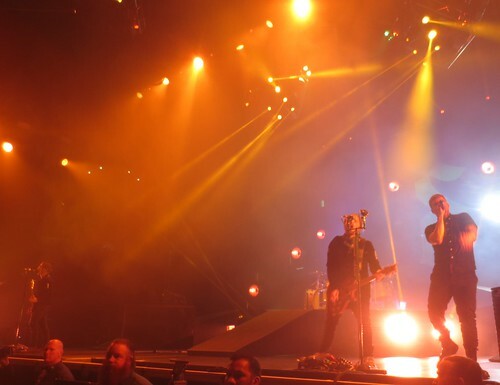 Eight shows, and Shinedown has not failed to move me once. Okay, kind of once, but that’s because they got upstaged. Still, I will gladly see them another eight times, and we will also probably consider another meet and greet, as that was money well spent. 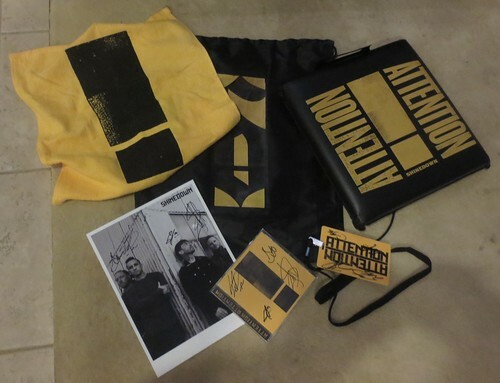 Towel, drawstring bag, seat cushion thingy, a photo we got signed, hard copy of “Attention Attention” we got signed (gave our other one to someone we befriended in line so she could give something to a friend of hers), lanyard that got signed. 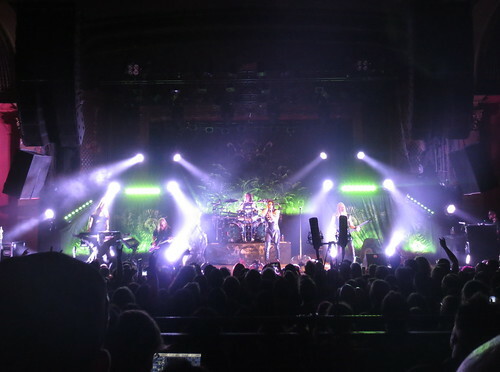 I was all set to write a post on a different subject and then realized I totally forgot I hadn’t blogged about this concert yet … probably because it got lost in the house shuffle. 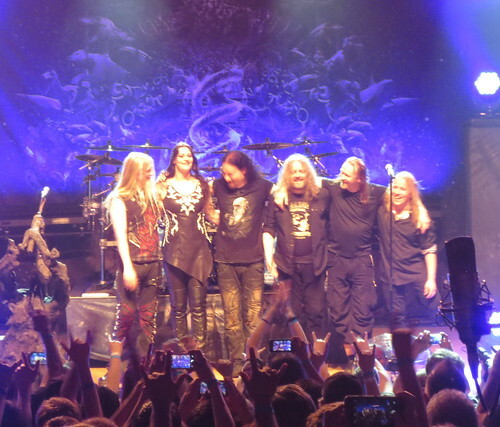 Anyway, way back on April 21 (so two months ago), I went to yet another metal show – Nightwish, with Delain and Sabaton. I’ve known of Nightwish since college – my roommate Amy was a big fan (same deal with Within Temptation) – but that was two (or three?) lead singers ago. 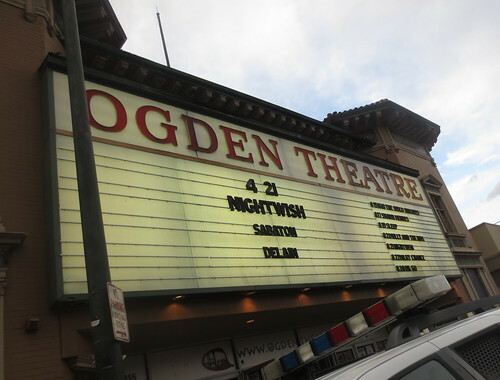 The show was at the Ogden Theatre, the only one of the Colfax venues I haven’t been to. Now that I’ve been to all three, I have to say I prefer the Bluebird over all. 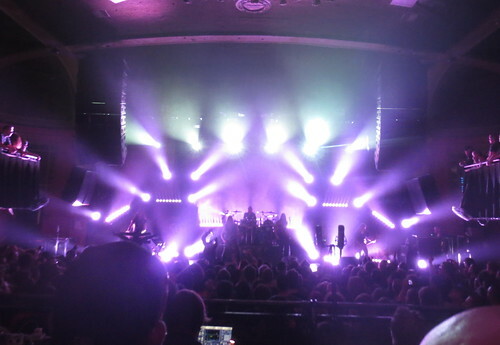 We also didn’t have the greatest spot at this show so maybe that led to part of my dislike of the Ogden, but eh. 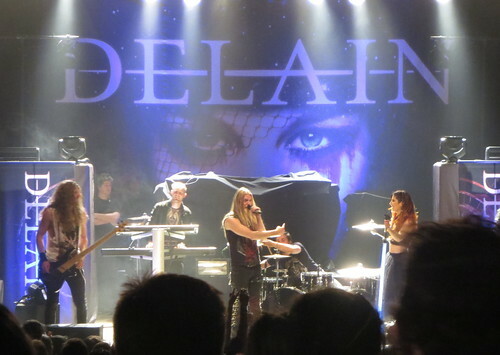 Delain I believe was already playing when we finally got inside. I remember them being better than Brandon led me to believe, but that could have been an Insomnium thing where they’re better live than in studio. 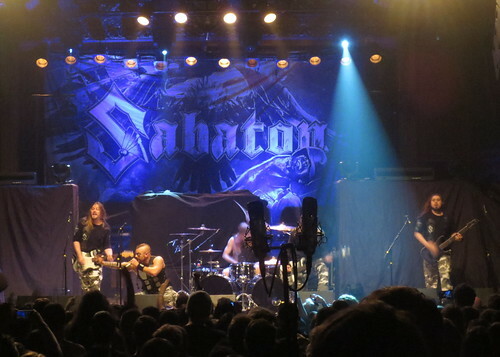 Next act was Sabaton, a Swedish metal band who plays songs based off historical events. Obviously I thought they were awesome. 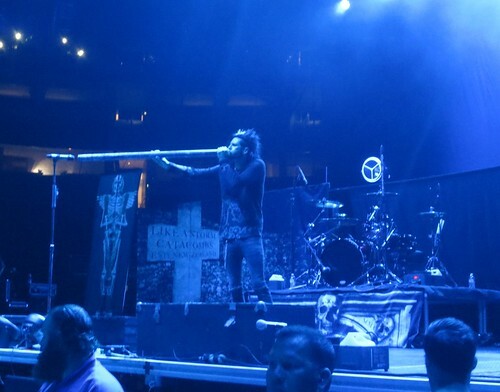 Even if I didn’t like their music however (although I did), I would have been a fan thanks to the lead singer. He noticed a young girl up on the balcony – probably about 12-years-old or so – and started talking with her. He learned that it was her first concert (I think; at least first metal show) and for a memory, tossed her his sunglasses. I believe metal gets a bad rap a lot of the time thanks to the stigma that all metal bands are devil worshippers and whatnot (okay, I get the Ozzy Osborne thing, but if you actually look at some of Black Sabbath’s lyrics … they were anti-war and politically motivated. Go on. Research “War Pigs/Luke’s Wall” and get back to me. ), but I have friends who are wonderful people and also huge metal heads (my friend Jeremy, for one) and have met some of the nicest people at metal shows. As a result, I’m super happy for the lead singer for making the gesture toward a young fan, because it proves that stereotypes aren’t always real. 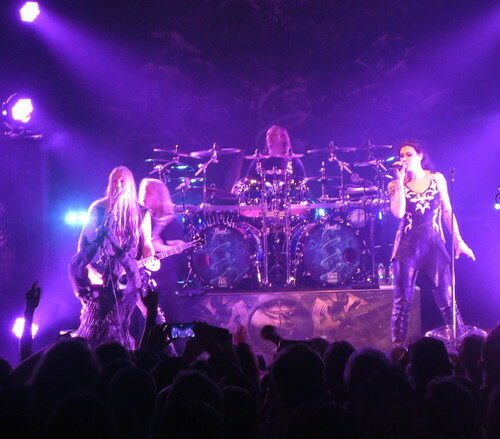 As for the Nightwish show, it wasn’t nearly as good as Epica or Within Temptation were. It wasn’t bad, per se, but I got hooked on Nightwish during the Tarja days, and Floor, while awesome, just isn’t Tarja. It’s a different sound (which both Brandon and Jeremy like, by the way), but it doesn’t quite do it for me. Would I see them again? I don’t think I can answer that question. Sabaton was fantastic and writing this post reminds me I need to look and see if their studio stuff is as good as their live stuff. 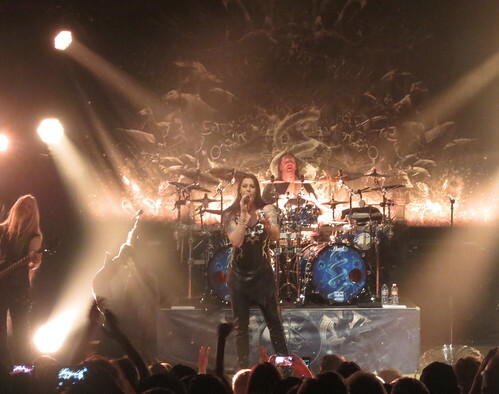 Nightwish … maybe. If it’s not at the Ogden.